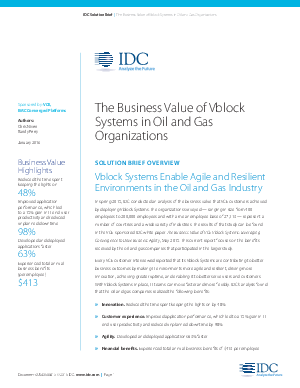 In the spring of 2015, IDC organized a study on the business value Vblock systems bring VCE customers. The organizations that took part in this study ranged from 400 employees to 200,000 employees, with an average employee count of 27,113. These organizations represent a wide array of industries and countries. The results of this study were published in the VCE-sponsored IDC white paper entitled, “The Business Value of VCE Vblock Systems: Leveraging Convergence to Drive Business Agility, May 2015”. All VCE customers that were interviewed in this study shared that Vblock systems have been yielding very favorable business outcomes – IT environments were reported to being more agile and resilient, propelling innovation, accomplishing greater uptime and serving customers more efficiently and effectively. With Vblock Systems, IT teams are empowered to move quickly and more flexibly.